Today we took the cable car up to the Vogel ski area. It only takes about 5 minutes to climb to over 1500 meters (nearly 5000 feet). 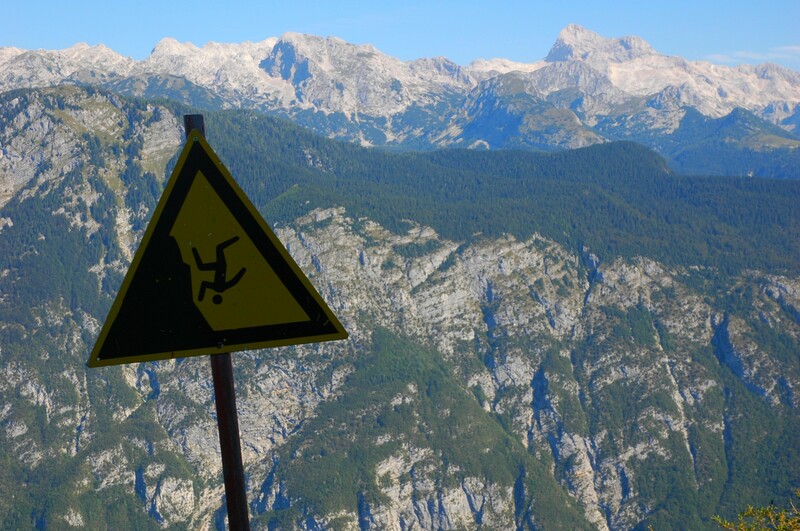 This sign was posted at the edge of a cliff that dropped several hundred feet, and I couldn’t resist the image of the plummeting figure. Here are a few more posted warnings I found, some obvious, some rather ambiguous. If all goes well, tomorrow we should have a shot of me and/or my older son holding large trout in early morning light. Really early morning light, so I’ve got to get to bed. Enjoy! Love the sign. Yosemite has some like this at the top of waterfalls.